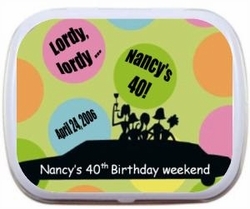 Personalized Birthday Mint Tins complete with limo! This Mint Tin screams It's Party Time! What a a fun and unique way to remind your guests of the time they had at your birthday Party! This totally FUN design can be personalized with 3 lines of text plus the date of event! Our designers did a wonderful job creating this tin to be funky, fun and full of color! Choose your favorite candy choice and mint tin color.